NextNew Pollinator Conservation Resource Center! If you’ve seen a tiny assortment of purple, bouncing specks in your snow, you might be looking at springtails. Don’t worry, they aren’t real fleas–they just bounce around in a similar way. Also, they are probably the cutest dang little things you’ve ever seen! Their tiny size is why you probably don’t know the earth is covered with these little fellows. The biggest ones are about 3mm–so you have to get very close to admire their cuteness. On average they run the size of the period at the end of this sentence. Springtails are incredibly abundant–there can be 250,000,000 individuals per square acre. They are active year round, but usually are hidden away under leaves or your favorite flowerpot. They need a damp environment. 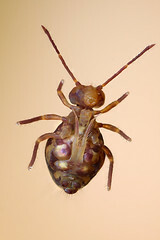 It’s a GOOD thing to see springtails in and around your garden and woods. They are found where there is rich organic soil, and they help make more soil by eating fungal spores, insect poop, and other items that decomposers usually snarf up. They very rarely cause any plant damage. Technically, Springtails aren’t proper insects at all, since their body has a slightly different design than the standard insect plan. 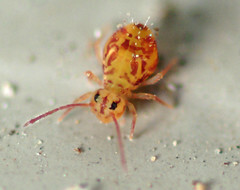 Their taxonomic name is Collembola, and while they are in the group Hexapoda (which contains the Insecta), they are not classified as insects. Their eyes are not proper compound eyes; they keep molting (shedding their exoskeleton) throughout their life; and their abdomen has fewer segments and some special extras that insects don’t have. But no one really worries about that besides pointy-headed entomologists like me. What’s with all the jumping? Springtails get their name from their jumping apparatus–they don’t use their legs to jump like fleas and grasshoppers, but have a special little appendage that flicks them up and around. You can see it in this great photo. This furcula is like a spring; when it’s released, it flings the springtail up over 100 times it’s body length. Alas for the springtail, they can’t control where they go–but it’s still an effective predator avoidance. But–how do they manage to be active in winter? Most insects are “cold-blooded“–a short-hand way of saying that their internal temperature is related to their environment’s temperature, much like snakes and frogs. And we all know that freezing is bad for living tissue–the formation of ice crystals disrupts cells and tissues. 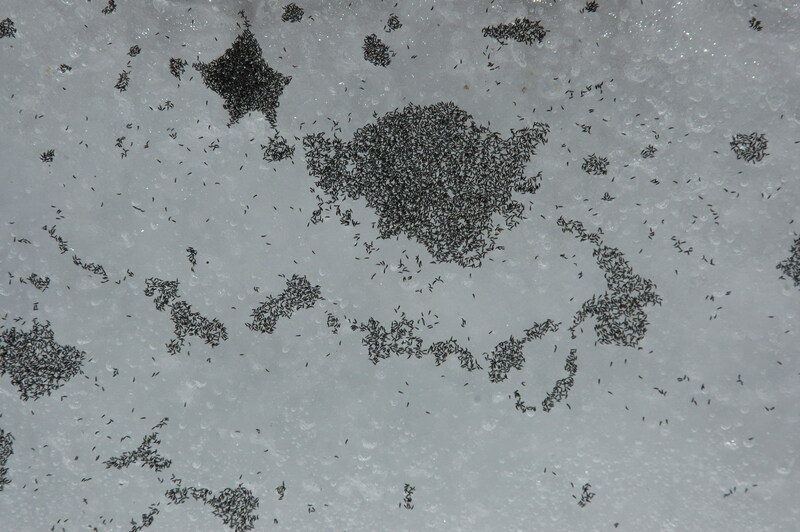 So the idea that Springtails can be active on snow in the dead of winter–or live in the Arctic and Antarctica (which they do), is kid of hard to get your head around. How do they do it? Some let themselves be dehydrated–since if you have very little water in your body, no ice crystals will form. Most Springtails, though, have antifreeze in their blood! This isn’t uncommon in insects, actually–and there are definitely some days this winter when I have wished for this. In fact, some researchers have suggested that some of the anti-freezing proteins in springtails could be used to save human organs for longer times before transplantation. So there you go– a neat little animal that you can see on sunny winter days around the bases of trees and in your garden. Tell a friend you’re going to go see “Snowfleas on Ice” and see if you can get them to believe it’s a skating show. Enjoy! Collembola.org –everything you could possibly want to know about Springtails! Also, I laugh at those people who think “snow fleas” are dangerous. do other insects also dehydrate themselves in winter? I’ve seen a couple of lacewings in my place, looking extremely thin, and I’m wondering if they do it deliberately or if the poor little things are simply wasting away. Any idea? Not to mention all the people who worry that “bark lice” or “wood lice” are going to bite them. Awesome post. I’ve known about the existence of springtails for years, but stupidly never stopped to wonder about how they do what they do. Fascinating critters! You forgot to mention that co-LEM-bo-la’ is a really fun word to say! co-LEM-bo-LA co-LEM-bo-LA co-LEM-bo-LA co-LEM-bo-LA ! That is THE cutest, friendliest, happiest-looking but I have EVER seen. Thanks SO much for sharing! I mean “bug” of course…. lovely post! no snow fleas where i live, but i sure love collembolans! For great footage on how they jump see the segment on Collembola in David Attenborough’s stellar “Life in the undergrowth”. I believe http://www.youtube.com/watch?v=gQ9h0R-_FTo&feature=PlayList&p=6C789083179F09A8&index=0&playnext=1 is the right episode. And thanks for the tip!! Collembola are in such dire need of more research. They fascinate me immensely, I always find such diversity in my samples (working on earth mites at the moment). New Pollinator Conservation Resource Center!